There’s been a lot of chatter online about the Netflix show Marie Kondo’s: the life-changing magic of tidying up. A self-confessed clean-aholic, Marie has admitted to being a bookworm herself but only keeps a maximum of 30 books in her home at any one time. This has been met with horror by book lovers everywhere – any good bibliophile knows that much of the joy of books comes from handling the physical book itself. So how can book lovers (perhaps ‘book hoarders’ is a better phrase) embrace Marie’s ethos without compromising their beloved bookshelves? If you are or you know a book lover, you’ll understand how they live… in piles: piles of books ‘to read’, piles of books ‘to finish’, piles of books ‘just because’ litter the home, occupying bedside tables, sideboards and tables around the house. Books are hefty items that take up space, attract dust and accumulate almost magically so we agree with Marie that it’s good practice to periodically review your collection to make space for new reads and reclaim home space. Follow our top tips for managing your book collection and we guarantee your treasured books will continue to ‘spark joy’ for years to come. 1. You re-read it regularly. There’s absolutely no point in getting rid of a book when you often return to it; you may as well set a £10 note on fire. 2. You truly love it. 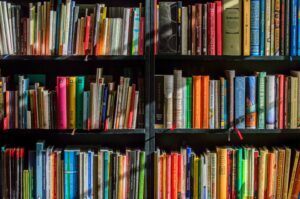 This can be a slippery slope where you can justify cleaving to every book you have, but don’t get rid of a book if doing so will be upsetting; that doesn’t make for a relaxing home reflective of you and the things you love. 3. The book was a gift. A book is a really special thing to give to another person, and whilst it isn’t really feasible to keep every book ever handed you to another person, if someone has chosen a book just for you (and perhaps even wrote a note on the inside for you) for a particular nostalgia or because it says something about your relationship, hold onto it. 4. It’s valuable. Don’t throw away any first editions, signed copies or books that have been in the family for generations. If you really can’t see any value in keeping it shelved, consider visiting an antiques dealer who specialises in books to get a steer on whether it’s worth trying to sell. Decide on one shelf or one bookcase as a goal of what to keep. As you come across these books in your collection, add them to your ‘to keep’section. It’ll be a comfort to see those books being saved as you decide to part with others. It’ll establish an actual boundary, too. You’ll see how much room left you have to use, and you’ll have no choice but to analytically about your collection. Right, the painful part! The culling. If the book doesn’t meet the following criteria, it’s time for it to go. 1. Get ruthless with your ‘to read’ pile. As a rule of thumb, if it hasn’t been read within 6 months of acquiring it, it probably won’t ever get read. We tested this theory and found many unread books on our shelves, however, we couldn’t bear to let them go! Instead we dedicated a shelf to ‘need to read’ books and made a note of the date. Any books still on the shelf 6 months after this date, we plan to remove. 2. Share the love. As you assess your collection you may find yourself thinking “So and so would LOVE this book!” -write their name down on a Post-It, stick it on the front cover, and set the book aside to redistribute later. 3. Lost in a book. Set aside one shelf of your bookcase as your ‘Desert Island’ bookshelf. Most book lovers have books they will never let go of, no matter what – they are the books we’d want with us if we were stranded on a desert island, that we could read over and over again for the rest of our lives!